Deputy Youth and Sports Minister, Pius Hadzide has charged athletes making the trip for this year's Commonwealth Games in Australia (Gold Coast) to act as worthy representatives. The Australia High Commission in Accra on Tuesday hosted the 72-man Ghanaian contingent to a well-organized dinner at his residence. In his solidarity message to the trimmed participants, the Minister told them to remain focused and aim at winning the country more laurels. He indicated that government will reward athletes who will excel in the Games accordingly. The Minister, who returned from Australia recently charged the participants to brace themselves with the challenge ahead – the long flight hours as well as competing with the best among Commonwealth nations in the world. He told the Australian High Commissioner, HE Andrew Barnes “Our athletes are in camp preparing feverishly for the games. They will have to respond to your invitation from their various camps. The government expects that you go out there and bring gold. He expressed gross thanks to the Australian High Commissioner for the dinner treat, intended for the Ghanaian contingent to have a feel of Gold Coast at the Embassy. HE Barnes gave assurance of how ready Australia is for the competition which starts from April 4 and ends on the 15th. Seventy-two athletes competing in 12 disciplines-athletics, boxing, badminton, cycling, hockey, table tennis, swimming, shooting, weightlifting, para-cycling, para-athletics and para-sports are expected to fly out of the country on March 10 for camping in Australia. Meanwhile, David Harper, CEO of Geodrill Limited has promised each boxer $10,000 should they win gold. 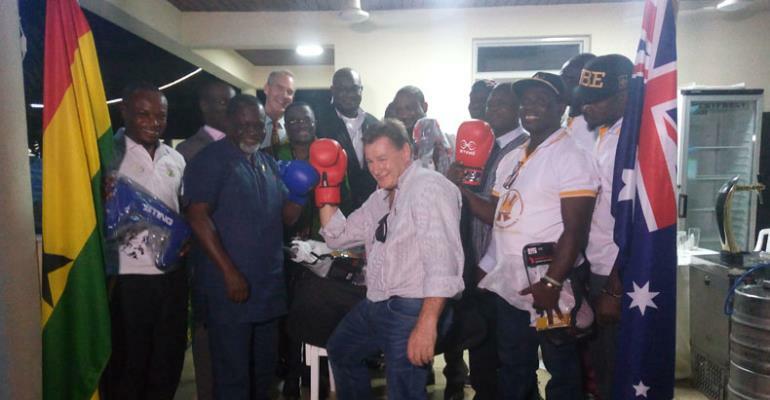 He together with boxing legend Azumah Nelson presented boxing equipment worth thousands of Cedis to the national boxing side –Black Bombers at the event.